The original “power polish,” CND Shellac combines the ease of polish with incomparable high-gloss shine and extended 14-day wear. ZERO dry time – means there's no need to wait to grab your keys at the end of your service. There is NO nail damage during application or removal, because there are no drills or nail surface filing required. Removal is extremely quick and easy with no soaking in acetone required – just ten minutes (yes really!) with a foil wrap and the quick release polymers in the CND Shellac base coat will ensure the shellac can be gently removed with an orange wood stick. Gel II® Soak Off Gel Polish is luminous nail color that applies faster, feels thinner, and lasts longer than any other gel available! Forget base coats, bond-aids, and primers. Gel II® delivers a fast two-step professional system that is unique from any other on the market. Fused with essential vitamins, Gel II® makes nails stronger, healthier, and stunning for up to 3 weeks! Removal is easy and safe with just ten minutes using a foil wrap and Gel II Gentle Soak remover and the polish just lifts away from the nail plate. IBX is an intense repair treatment that works inside the nail. 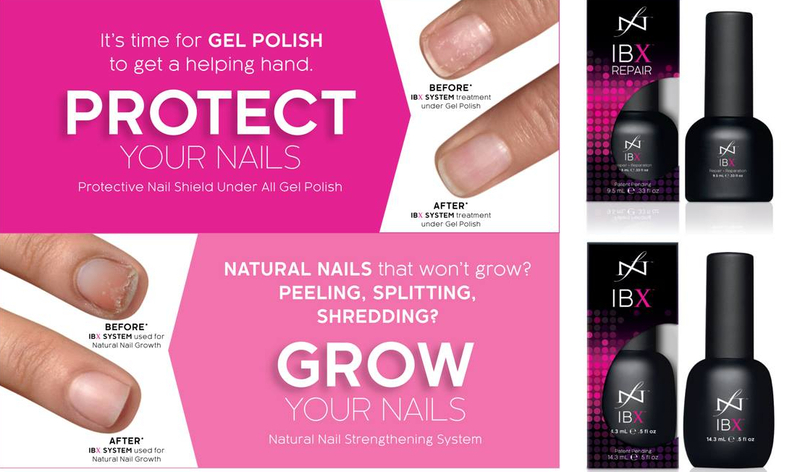 IBX actually fuses the layers in the upper portion of the nail plate together by acting like double sided sticky tape which seals damaged areas together and adds strength and an extra layer of protection to the natural nail. Included in this 6-Step organic product based Diamond Treatment Pedicure are Diamond Spa Crystals, Ocean Spa Crystals, Sugar Spa Scrub, Purifying Mask, Continuous Massage Lotion for a luxuorious hand / foot massage and Spa Cuticle Oil. With MoYou London stamps, fabulous Lecente and Magpie glitter, summer neon pigments and genuine Swarovski crystals the combinations are endless. View our gallery to see the beauty that can be achieved with these products.